This may be a mundane answer, but I prefer when there is only one viable deck in the format. It simply makes testing much easier because I do not have to worry about trying out every single Pokémon deck possibility out there. It allows me to really focus on that one elite deck and perfect it, both in terms of the list and of strategy. Just because everyone else is playing the same Pokémon, it does not necessarily mean the games are going to be boring. You are able to get to know your deck inside and out, which allows you to be confident of your play during almost any game situation. When there is a plethora of decks to choose from, you are more likely to run into matchup problems during tournaments. This can be unavoidable and is simply luck of the draw. A multitude of different Pokémon deck options usually means that some of those decks will have quite auspicious chances over a specific matchup, while being at a disadvantage versus another. This is the nature of there being several good decks. I will say however, that I enjoy trying to come up with new decks to take out the top dog. If you can come up with a new idea that no one else has thought of and it succeeds, it is an awesome feeling. It is not an easy task, but it is feasable. 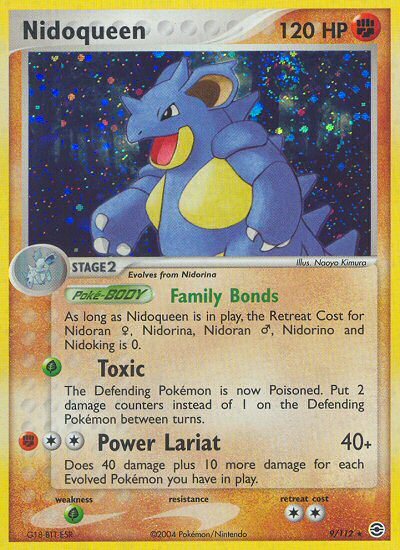 Our Nidoqueen deck that won Worlds a few years back is a prime example. When Delta (Raichu/Exeggutor) won Nationals, that was really cool too. You just need to analyze what everyone else is using and find a flaw that you can exploit in those decks. It seems as though a lot of people can OHKO a lot of single Pokemon, since a lot of (at least mine personally) decks run fairly few Pokemon and a majority of trainer/supporter/stadiums, donks are very very common in this format. I really don’t like that donking is very common nowadays. Actually dude I think people aren’t getting donked as much as you’d think. People are running more basic Pokemon and 4 Call Energy in most decks. At least from what I heard, donks were not that abundant at Nationals. I also think that Qua identified one of the causes of donks; as he put it – a lot of decks run fairly few Pokemon. Maybe the answer to not be donked as much is to try running a few more Pokemon – even 1 or 2 more basics in the deck might make a big difference in whether you start with 2 solid basics. Ya totally, you would be surprised how much of a difference just a couple extra Pokemon can make. Yeah, I see… I asked around at my BR, for I noticed after my friendly match with the guy, a LOT of people were done really quickly! Round 1 of Burlington BR’s resulted with 8 donks… EIGHT! I dunno if its just bad luck for a lot of people, but maybe people are starting to notice the increase donkery… I read a few articles on Gym about the increase in donks and I tend to agree, also, at the local league, a lot of people start with 1. I guess that’s the reason for the increase in donk’s popularity. i agree with some thing’s you said…..